Told you I'd be back with more info for February's emergency preparedness. You're probably wondering thinking, huh? Why these items? Ok, an axe you would need to be able to cut things down. But paper towels? Trash Bags? Foil? Let me tell you that these things would serve you in ways you probably never would have thought of. Foil: has many uses. Let me name a few. Paper towels: what would you use paper towels for? So not as un-useful as you might have thought, huh? I didn't buy the expensive ones, bargain brand will do just fine. It's February! How did you do in collecting your items for January? I wanted to share with you before I got into what we need to do for February, my awesome finds for the January items. 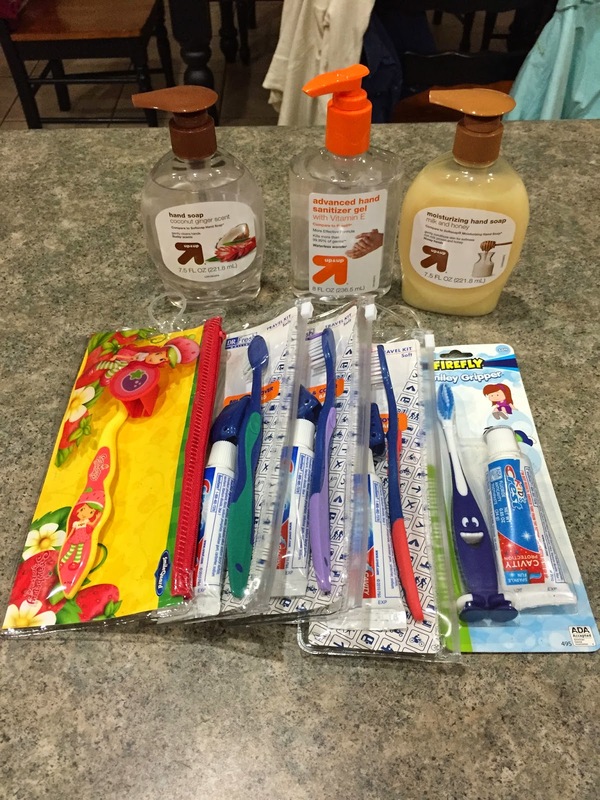 I found the toothbrush kits at the dollar store and the soap at target for less than $1. 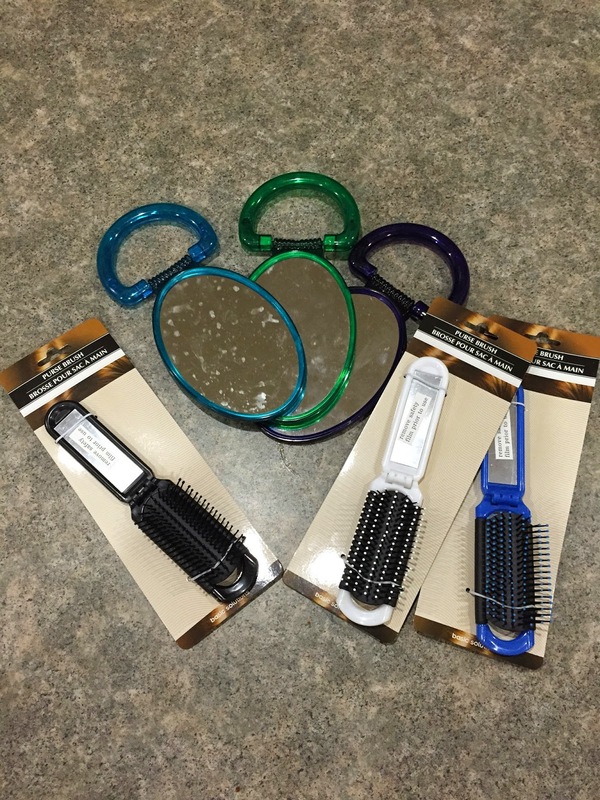 These are for the 72 hour kits, I also found these at the dollar store. Now, onto what we need to do for February. This month we are collecting grains: wheat, rice, corn, etc. Grains are such an essential staple for any food storage. You need to make sure that you are collecting enough for each member in you family. You can collect flour or hard/soft wheat kernels. Freshly ground wheat is one of the most nutritious foods we can eat. It's a great source of fiber and it is fairly inexpensive. What you need to know for collecting wheat: A minimum of 200 lbs per adult is a general guideline to use. You can even go up to about 350 lbs per person max. The thing is that you don't want to be short of have an excess that you may end up wasting. I will be the first to admit that I'm no good with math so I have found a couple of sites that have done some math and give some great examples. Living Prepared has done a great example for a family 4. He has done a breakdown of how much wheat a person may consume in a year. I even found an online calculator that can help you determine how much you need. So, using the calculator my family of 5 needs about 600 lbs of wheat for 1 year. That sounds like a LOT but when an emergency hits, it will be just right! Where am I going to store 600 lbs of wheat?! That is a very good question. I don't have a lot of space and here in Arizona it gets hot, so storing it out in a shed is not an option, unless it has its own air cooling system. Something to look into for the future. I'm going to need to get creative in my storage place, but I discuss that at a later time. When collecting your grains make sure you're storing the grains that your family will use and eat. Don't just store anything just to store it. Be smart about it. Here are a few other things to consider for storing grains. Rice: There are different kinds of rice. Long grain white rice is a popular rice to collect and it usually available in bulk through the emergency preparedness sites. But if you prefer the other types of rice collect that and make sure it is stored correctly to last. Brown rice is very nutritious, but the downside is that it does not keep as well as white rice. You may want to consider brown rice as a 3 month food storage item and not long term. Again figure out what you need, use the calculator that I mentioned above as a guide to help you out. Corn: you can collect kernels that you can grind to make up cornmeal or use to make popcorn. Or get already made cornmeal to store. Oats: How much oatmeal will my family need? Do I plan to use it for breakfast daily and in many other recipes? Or will I use it primarily for cookies? Are questions we should ask when storing oats. Not everyone uses oats. Again only store what you need. Side note: a #10 can holds about 12 cups of oats. Most importantly make sure you are rotating your food storage and replacing items. 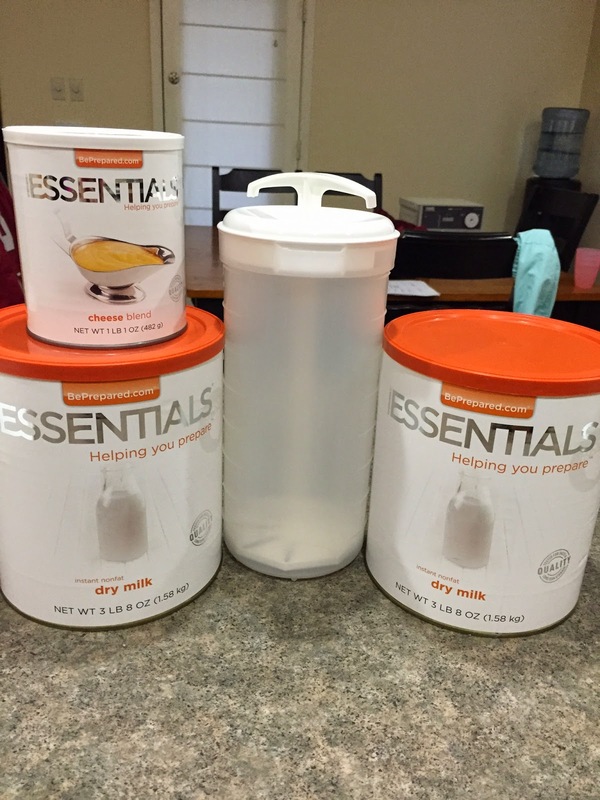 Use your food storage, it doesn't have to only for an emergency. By using it you will gain a better understanding of how to use it so that when a disaster does strike you aren't scared of how to use it. I will touch back later this month with the other items on the list that we should be collecting. It's been a while since I posted a craft on here. The other day I was at the dollar store and they had their Valentine's Day stuff out and I saw red rose bouquets with hearts and the the idea just hit me that I needed to make a wreath using those flowers. 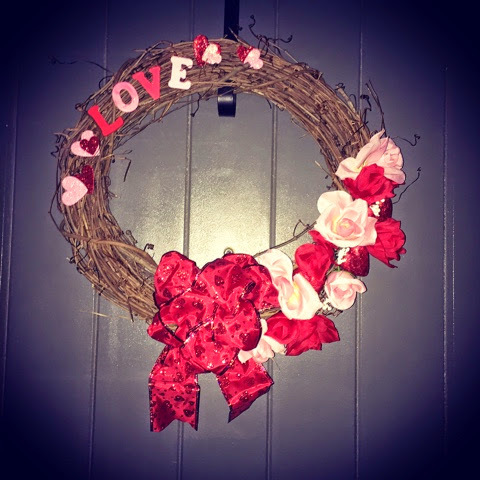 I didn't have a wreath for Valentine's Day and it was probably time that I make one. 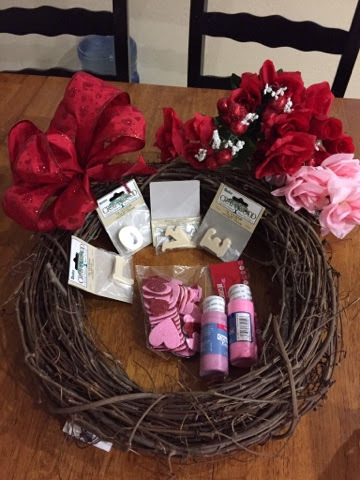 I bought a stick wreath, those flowers, foam glitter hearts that I also found at the dollar store, wood letters, and went to work. I painted my letters first so that they would dry as I was gluing the flowers. I placed my flowers and the hearts and then glued in place. I had found a ribbon bow at Michaels, it was badly made so I re-tied it so that it looked prettier. Once the letters were dried I glued them into place with foam hearts next to them. Here is my final result. I loved how it turned out! !